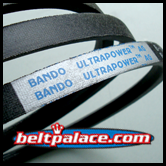 and PTO Belts > BladeRunner Outdoor Power Equipment Belts > BladeRunner 6592BR- Outdoor Power Replacement Belt > B79-KC Ultrapower V Belt. Kevlar B79 Industrial V-Belt. 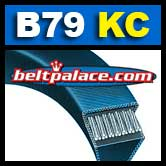 B79-KC BANDO ULTRAPOWER AG Belt. Kevlar B79 Industrial V-Belt (B79K). B Section = 21/32” (5/8”) Wide x 82” Length OC (16mm x 2083mm). Features superior “clutching” Aramid (Kevlar) fiber cover for high durability and extra long service life. Heat and oil resistant. Excellent for home and commercial lawn & garden machines! GATES 6592BR BLADERUNNER L&G BELT. OEM Replacement for: OEM 5L-820, OEM B079, OEM B79, AYP 2295R, AYP 5091H, AYP 56823, Bobcat 38039N, Bobcat 38075, Grasshopper 382049, MTD 754-0175, MTD 754-0178.